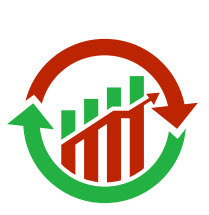 Indices enjoyed one of their best weeks in a long time. 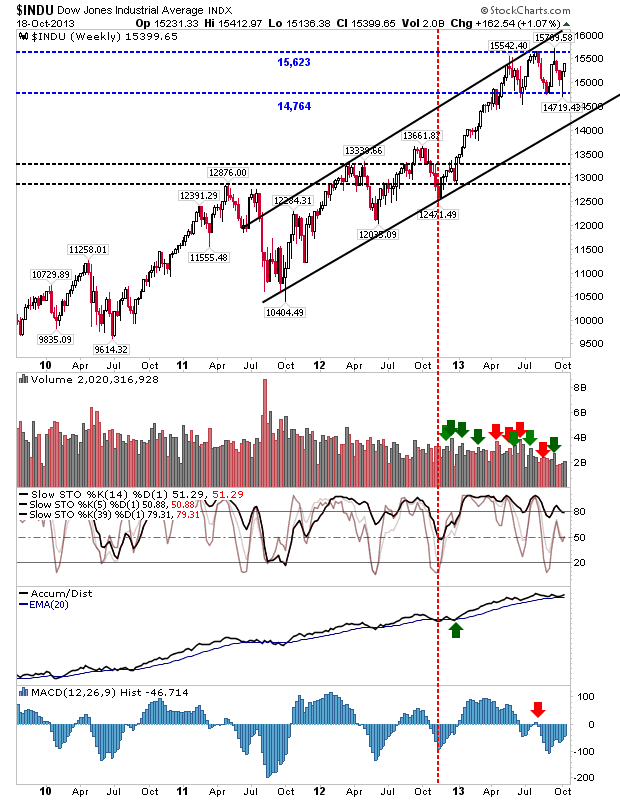 The Nasdaq finished with over a 3% gain to leave the index with a breakout from its rising channel. 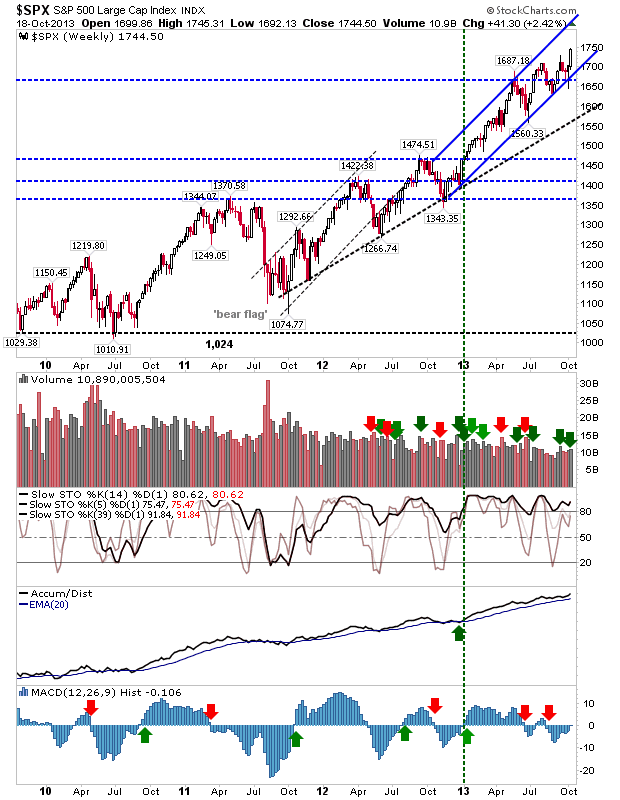 Technicals remain in good shape, although there is a bearish divergence taking shape in the MACD histogram - which will catch up with the index eventually - but it will take a 'bull trap' to confirm (a drop below 3850 on the weekly chart would probably suffice). Nasdaq Breadth has made two significant turns: the Percentage of Nasdaq Stocks above the 50-day MA and Percentage of Nasdaq Stocks above the 200-day MA have both cleared strong bearish divergences. The same looks to be happening in the Nasdaq Bullish Percents. All of this is good news for bulls looking for this rally to continue. 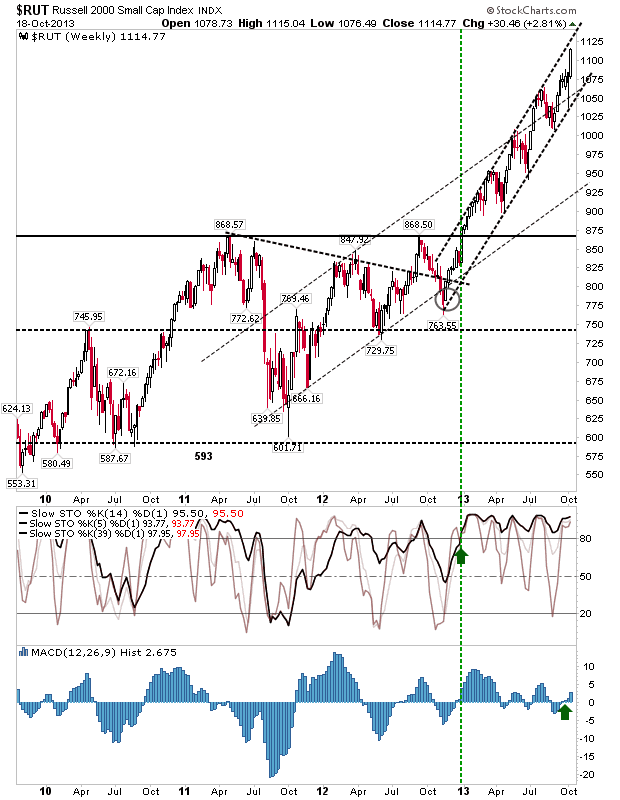 The Russell 2000 is trading inside a sharply ascending channel, but last week's gains didn't break the boundaries of the channel. Look for resistance to kick in at 1,125. The Dow remains range bound, with support at 14,764 and resistance at 15,623. It could remain within this channel until prices meet rising channel support, late this year or early next. The S&P looks good under these conditions after successfully finding support at the rising channel (on a 1,650 spike low) the previous week, and building on this test with a push above 1,700 (new support). 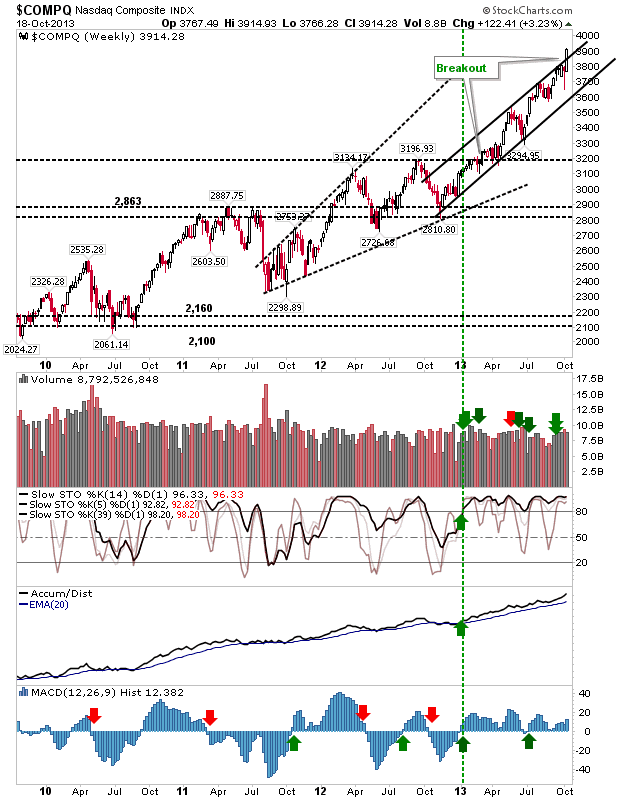 A new MACD trigger 'buy' is also in the works, and there is plenty of room to channel resistance. 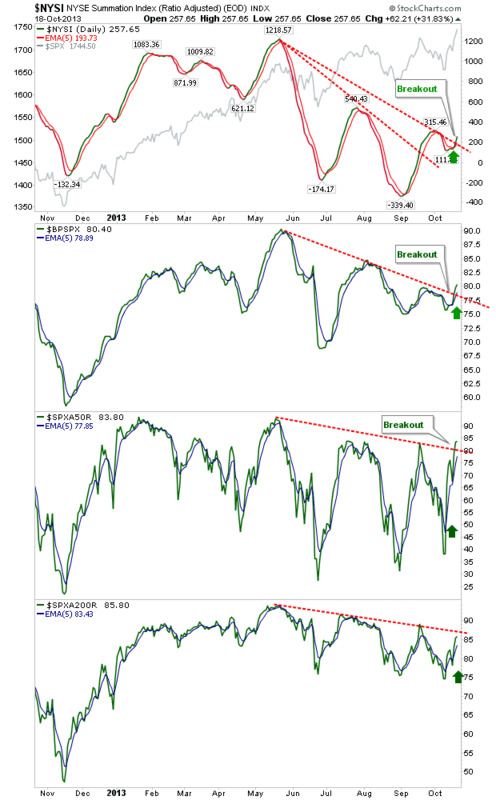 S&P breadth is also breaking from bearish divergences in support of the move in the S&P. Whatever about the uncertainty over the debt deal, the weekly charts have remained firmly on the side of the bulls. 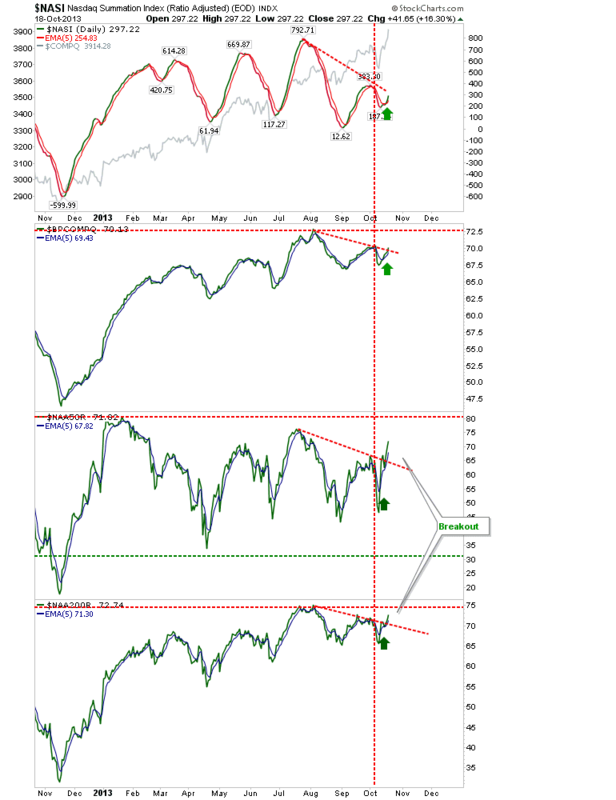 Last week's action confirms this, and suggests further upside is likely.